The president said a mechanism of counteraction to hybrid wars is necessary. 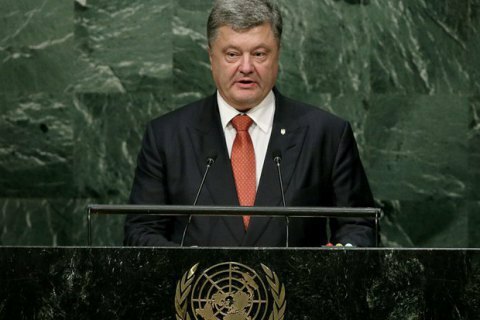 President Petro Poroshenko has said the right of veto for member states of the UN Security Council involved in armed conflicts must be suspended. He was speaking at the 71st UN General Assembly in New York. "The suspension of the use of veto in cases of mass atrocities, as well as in cases when a UN Security Council member state is a party to a dispute, should become a rock-solid rule without exceptions," he said. "We can no longer afford the Security Council deadlocked on key issues of international peace and security. Limiting the use of the "veto" power in decision-making on conflict prevention and resolution should become a priority task within the Security Council reform," he went on. He said there was a "critical need" to make the UN capable of addressing effectively acts of aggression and to bring those responsible to justice. According to Poroshenko, a mechanism should be developed to counteract hybrid wars. "Another threat to international peace and security that requires urgent attention of the world community is hybrid wars. It is time for the Security Council to go resolutely and effectively into this issue," he said. He recalled that Ukraine became a "testing ground" for new methods of hybrid warfare. "Political pressure, blatant propaganda, interference with electoral processes, economic coercion, secret subversive and military operations, cyber attacks, misuse of diplomatic measures – these are modern unconventional methods of undeclared wars," he said. In the past, Russia used its right of veto on several occasions, in particular to block a tribunal on the downing of the Malaysia Airlines flight MH17 above Donetsk Region.